When I was a child, Christmas was truly my very favorite time of year. I loved everything about it.... especially how it seemed to make my family come together. My parents divorced when I was 10, but there were many, many years of turmoil between them before they split up (and many years after they split up, too!). Somehow though, the holidays always had a way of bringing them together and encouraging a temporary cease-fire. And therefore, I guess it brings back lots of great memories for me. 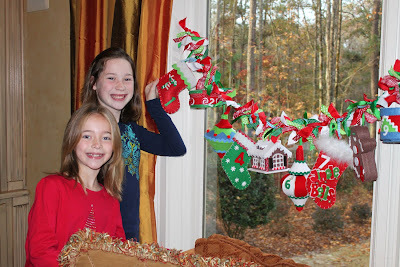 My mom was creative, and we had lots of traditions like making gingerbread houses and sewing special ornaments. I loved the music and the anticipation of opening all those gifts under the tree, and I especially loved the story my sister would tell me every year of waking up one night and hearing something on top of the house, and when she looked out, she saw Rudolph's nose shining in the black of night. I sooooooo believed her! I can remember waking up at 5:00am much to my parents' dismay..... back then it was so special to receive any kind of gift, and I could hardly wait to tear open the first package. Ever since I've had my own children, I've tried to make the holidays a special time of year for them, too. This year I worked really hard in November to come up with lots of fun projects for them. And I created a little project of my own, too..... well, maybe not so little. It's an advent calendar for the kids to count down the days until Christmas. When I was a child, we would visit my mom's aunt every year for Thanksgiving, and there was a Christmas store in her town. I would buy an advent calendar there each year, and it was such a treat to open those little doors to find a new prize each day. 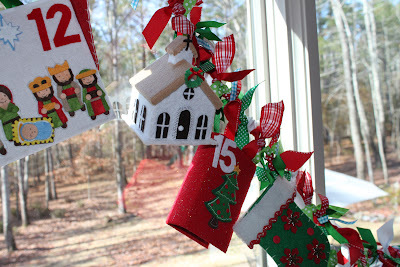 For years now I've wanted to make my own children an advent calendar to pass down and use each Christmas. 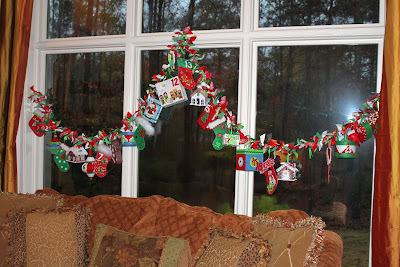 So this year I got serious about it and came up with an idea to make a large countdown to display in the house. I scoured the stores for neat things I could cover with felt and hide prizes inside. 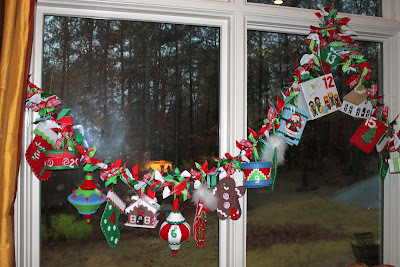 Then I strung them all up on ribbons and attached a number to each of them. It was definitely ALOT more work than I anticipated, but now that I'm almost done, it was well worth the 100 hours or so it took to make. Here's a picture of the final result (well, except for day 21 which I still haven't gotten around to making!). If you click on the photos, you can see the a larger image. and sometimes it's a piece of candy with a note about an activity we'll do that day. It's been fun, and of course the kids are loving it. books, gifts and more all with prizes hidden inside. Here are some close-up shots. I loved making all the gingerbread houses.... especially the church. The roof lifts up on one side to open the house up so the kids can find their prizes. It was a huge project, but you could make it a little easier if you wanted to make one. I've seen small stockings at the Dollar Store or small gift boxes that you could string up, put a number on, and fill with treats. 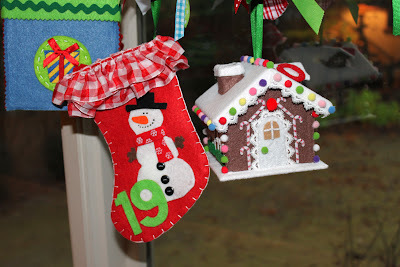 I even saw some cute knitted mitten ornaments that would be great to string up -- the possibilities are endless so have fun making one of your own -- your kids will LOVE IT! Beautiful pictures with great content and information, thanks.